Anyone who has been to Paris and experienced the pastel delights of Laduree Macaroons will probably be as excited about this as I was! 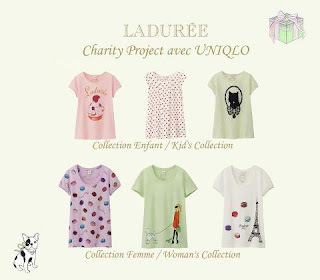 Laduree have teamed up with Uniqlo to design a range of gorgeously-girlie Parisien themed t-shirts which will be sold exlusively in Laduree Shops, and Uniqlo Stores in London, Japan and New York. You will be pleased to note that you can also purchase these lovely t-shirts online for a mere £12.90! 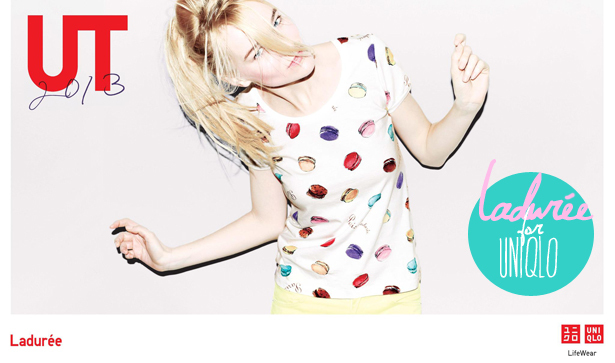 The link to the Uniqlo online store is below the image. These are an adorable addition to a spring wardrobe - I may *have* to invest!